Did a member of your family fight in WW1? Do write a guest blog contribution for November 6 or 13 in Remembrance for FootSoldierSam… Please send by email Free Memoir to contributors. A hundred years ago this week… the further north the fight the closer it was to “shutting down’ for the winter. On the Western Front, bar some bloody skirmishing, the British/French and Germans tacitly agreed to a breather in the mud and rain at the Battles of Ancre Heights and Le Transloy (the tail end of the Somme, though it’s concluding date is regarded as November 18 – the latter battle’s casualty figures for October: Allied 95,348, 78,500 German). However, prop tem, French success encouraged them to press on with their First Offensive Battle of Verdun where they recaptured Fort Vaux (November 1) and Damloup (4). On the Eastern Front Russian success had peaked with the summer’s Brusilov Offensive, but their powers had not yet collapsed as they fought the German Army to and back around the River Narajowka, Galicia (October 30-31). But Germany and Austria flaunted their confidence when they declared an “independent” state of Poland (November 5). In the Battle Of Transylvania, started by Romania on August 27, Austria progressed in several areas (Predeal Pass October 31, Torzburg and Roter Turm Pass November 1) despite a setback in the Vulkan Pass (2) and a Russian naval bombardment of Contanza on the Black Sea, lately taken by Austrian-German forces (4). The Italian Army instigated the Ninth Battle Of The Isonzo (October 31-November 4) around Vrtobja and the Karst Plateau (in current Slovenia). Although the Italians made some headway, taking Falti Hrib (November 2) and Mount Volkovnjak (3), casualties proved prodigious, as in its immediate predecessors – Italian 39,000, Austria-Hungarian 33,000 in five days – that they again broke off their attack. A little further east in Macedonia, other significant action saw the Bulgarian Army pushed back by the Serbians in the Cherna region (October 30) and by the British on the River Struma front (31). Meanwhile, my father, under-age volunteer Corporal Sam Sutcliffe from Edmonton, north London, 18 on July 6, 1916, had fought with the Kensingtons Battalion from mid-May to September, at Hébuterne/Gommecourt on the north end of the Somme Front, then around Leuze Wood and Morval to the south (FootSoldierSam’s Blogs dated May 15 to September 25, 2016). About September 30 he was told his age had been officially noticed, he was still legally too young for the battlefield and he could take a break until his 19th birthday if he wished. He wished all right – though not without a sense of guilt. He left the Front for the British base camp at Harfleur and a surprise move into catering. 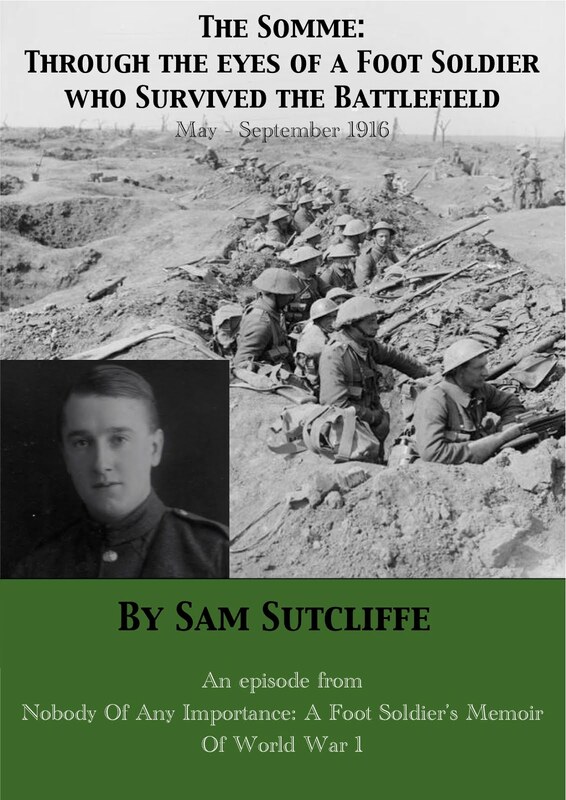 For Sam, who joined up in September 1914, this followed a ’15-’16 winter at Suvla Bay, Gallipoli, with the 2/1st Royal Fusiliers (200 out of 1,000 avoided the lists of shot, shell and disease casualties – Blogs dated September 13, 2015, to January 3, 2016). They’d sailed to France in late April, 1916, where – to their disgust – they were disbanded and transferred to other outfits… Sam to the Kensingtons and the Somme front line (on July 1, they suffered 59 per cent casualties). Last week, my father got stuck into his new role as a food buyer for his crafty old Royal Fusiliers comrade Archie Barker’s, um, semi-official caff at the massive Harfleur British Army camp, providing his fellow Tommies with a few tasty luxuries – all profits to the Captain Quartermaster, he presumed. Not getting shot at and shelled for a while amply compensated him for the difficulties of learning an entirely new trade in a foreign country… as did the (platonic!) friendship and assistance of grocer’s daughter Marie-Louise Baudlet, who not only sold him some of the items he needed but taught him the French phrases he needed and advised him where to go in the big covered market (Les Halles) for his larger orders. ‘For some reason which I didn’t quite understand, but didn’t concern myself with, another man began to come along with me on the trips into Le Havre. A Lieutenant to the Captain Quartermaster had arranged it, and when this fellow joined me, he said he simply had nothing better to do. He could speak French, which might come in useful sometimes, and he could stay with the wagon if the driver wanted to go off somewhere. What he, a young man of maybe 20, was doing at the base I didn’t know and I don’t recall ever asking him. Eric Brays was his name; five feet nine, well-built and fit, his face wore a moustache and a smile. He belonged to the Honourable Artillery Company, a London Territorial Army unit with its own long traditions and barracks in the City Road; it generally recruited from the sons of City merchants and businessmen. Eric never said anything offensive nor argued about anything. He came along for the ride. I introduced him to Marie-Louise as a chap who spoke perfect French, so they conversed in her language. Afterwards, she told me he spoke a Southern patois. He explained that, to improve the French he learned in school, his father had sent him to live with a farming family in Southern France, so he spoke as they did. Eric was sometimes a bit of a joker, though, and one of his little amusements almost landed us in trouble. The market stood in a square with streets on all four sides. A very fine building, its roof and walls to a great extent comprised large, glass windows, so you could see in and out. The newish covered market – Les Halles – Le Havre, 2016, snapped by Phil Sutcliffe on the Somme100 trip. Probably not so grand as the building where my father, Sam, bought treats for the troops (and had his Cockney rhyming contretemps) but still a nice, aromatic place to shop for your groceries. One day, when I’d finished my buying, I and the two girls from the fruit and vegetable stall wandered away and stood talking in the middle of the market. Some joking was going on – slightly naughty, I expect – and Eric got into a discussion with one of the girls as to the meaning of an expression much used by Tommies, namely, “Wormwood Scrubs**”. Eric tried to explain about Cockney rhyming slang: so, Scrubs – bubs – breasts. You can imagine the girl’s eventual understanding and laughter; she said, “Ah, these then!” signifying with her hands, “These Wormwood Scrubs!” More laughter. Well, would you believe that leaning out of her window on the far side of the street watching us was a licensed prostitute? Marie-Louise told me the full story later. ** Wormwood Scrubs is a men’s prison completed in 1891 and still in operation. Among its notable inmates over the years have been Lord Alfred Douglas (writer and Oscar Wilde’s “Bosie”), Horatio Bottomley (the John Bull magazine publisher/Army recruiter/MP/fraudster whose oratory helped persuade my father to enlist in 1914, see Chapter 4 of Sam’s Memoir), Basil Bunting (poet, imprisoned for conscientious objection in WW1), Michael Tippett (composer, likewise in WW2), and rock’n’rollers Keith Richards (Rolling Stones) and Pete Doherty (Libertines). Next week: In the first of two retrospectives around Remembrance Day, the blog steps aside from Sam’s Army catering interlude to recall key moments of his experiences in the front line at Gallipoli. The following week, on Remembrance Day itself, we’ll return to the Somme, July 1, 1916, and beyond. Sam gets to know Marie-Louise and her mother thinks he’s très gentil… but she’s married and he’s keeping his mind on apples and pears. Did a member of your family fight in WW1? 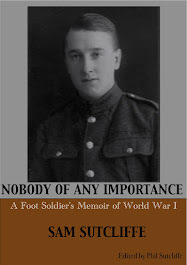 Do write a guest blog contribution in Remembrance for FootSoldierSam… Please send by email Free Memoir to contributors. A hundred years ago this week… On the Western Front the last few costly blows were struck while the strategists considered that odd business of pitched battle bedding down for winter. In the northern part of the Somme Front, the Battle Of Ancre Heights saw the Canadians advance (October 26) and the British attack Beaumont Hamel and Serre with teargas, phosgene and phosgene/chlorine mortar bombs (28) before bad weather (29) stopped the fighting for a couple of weeks. At The Battle Of Transloy, after a British advance (23), the German Army settled into effective defence aimed at holding their ground until winter called a halt. But at the First Offensive Battle Of Verdun (the French name for it translated), begun on October 20, the French Army recaptured Fort Douaumont (24), then several other key points, and by the end of the week had begun an artillery bombardment of Fort Vaux (one source notes that all this took them back to the positions they’d occupied in May). On the Eastern Front, the Russian Army’s loss of impetus continued as the German Army drove them back from the left bank of the river Narajowka (October 22; Galicia), and across the river Schara, near Minsk (27; now Belarus), although they showed they still had victories in them at Vatra Dornei (25; then Bukovina/Moldova, now in Romania). Similarly, their support for Romania in the Battle Of Transylvania (began August 27) wasn’t going well. The combined Bulgarian-German forces defeated the Romanian Army at the Predeal Pass (23) and Cernavoda (25), but did find themselves on the retreat in the Jiu Valley, Wallachia (27-9). The Allies most complicated alliance (Serbian-French-British-Italian-Russian involvement) did rather better in Macedonia as the Monastir Offensive (September 12-December 11) continued to beat back the Bulgarian invaders – who had driven the entire Serbian Army into exile earlier in the year. In the Battle Of Cerna Bend, the Bulgarians abandoned Cerna Voda (October 25), but that part of the conflict remained mainly bogged down causing heavy casualties (Bulgarian-German 26,000, Serbian-French-Russian12,000 before it ended in November). 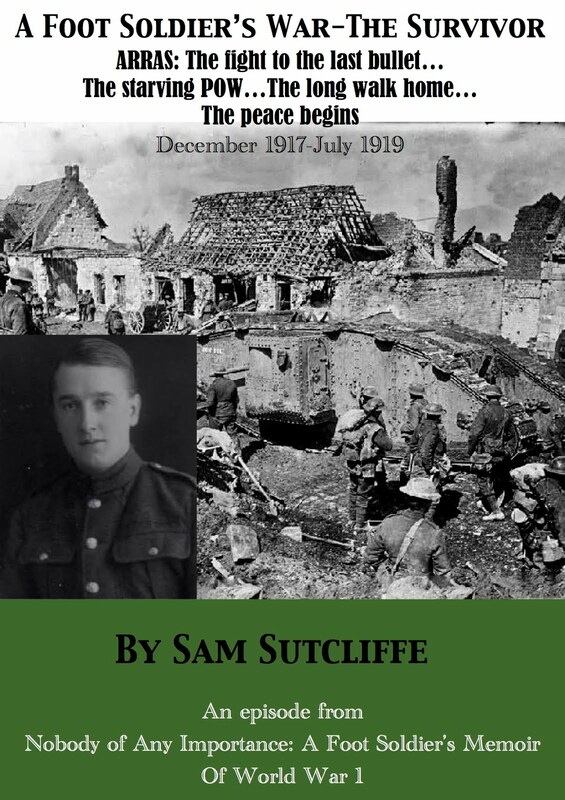 Meanwhile**, my father, under-age volunteer Corporal Sam Sutcliffe from Edmonton, north London, 18 on July 6, 1916, had fought with the Kensingtons Battalion from mid-May to September, at Gommecourt on the north end of the Somme Front, then around Leuze Wood and Morval to the south. About September 30 he was told his age had been officially noticed, he was still legally too young for the battlefield and he could take a break until his 19th birthday if he wished. He wished all right – though not without a sense of guilt. That same day, he left the Front for the British base camp at Harfleur. For Sam, who joined up in September 1914, this followed a ’15-’16 winter at Suvla Bay, Gallipoli, with the 2/1st Royal Fusiliers (200 out of 1,000 avoided the lists of shot, shell and disease casualties – Blogs dated September 13, 2015, to January 3, 2016). They’d sailed to France in late April, 1916, where – to their disgust – they were disbanded and transferred to other outfits… Sam to the Kensingtons and the Somme front line – where, on July 1, they’d suffered 59 per cent casualties (see FootSoldierSam’s Blogs dated June 26 and July 3, 2016). 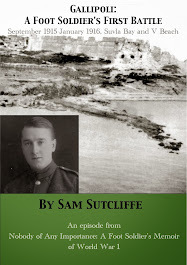 Last week, Sam decides to go along with his crafty old Royal Fusiliers comrade and caterer Archie Barker’s lie that he had been a grocer pre-war and thus moves into a short, happy career in the Army café business – on the unofficial side as Archie’s establishment seems to be a private enterprise run for the profit of the Captain Quartermaster. ‘Marie-Louise Baudlet; I suppose I can mention her full name now as she was somewhat older than me – I can only estimate 21 or 22 – and she must have passed away long ago. She wasn’t pretty, but quite attractive, dressed in severe black with white trimmings. She probably looked older than her years, bright, smiling eyes. She made me welcome. She spoke perfect English and told me that, before the war, she had made several visits to England and stayed with relatives in Richmond, Surrey; my translator, then, ready to hand. I soon had a friendly working arrangement with Marie-Louise. I bought what I could – as much as possible of what they had to offer. But, as Marie said, items of which I needed a large quantity I would have to buy in the market; so, apples, other fruit and fresh vegetables, butter (selling cheaply from a counter run by a Belgian lady) – all luxuries for the soldiers. This photo of Les Halles market, Le Havre, probably from the 1920s, is on the wall of the present market, pictured below. My pix from when I was in France this summer (2016) to attend the Somme100 commemoration. ‘Back at the canteen, Archie taught me to make thin, very tasty sandwiches. Tinned salmon was favourite. I’d empty a can into a large bowl, beat it up adding salt, pepper and vinegar and tasting it from time to time until I got it just so, that slightly salty mouth-watering flavour to make the ideal sandwich. We sold dozens of them. He taught me to build them up in pyramids — placed out of reach of the troops, that was important, but visible and tempting. On the evenings the lads were in the money, the two of us often had difficulty coping with the great rush of trade. More money became available to buy fresh vegetables, and I bought apples and sometimes pears on a bigger scale too. The whole business reminded me very much of pre-war days when sometimes, to order a lunch for the partners at Lake & Currie, I’d go to Sweetings*** or Binns, famous restaurants, where they displayed their sandwiches stacked in pyramids and the clients ate them with a pint of beer, then threw some money down on the counter and left. Even the aroma in our canteen — the various sandwiches we served, and perhaps coffee as well as tea – could sometimes recall those grander establishments. I did no Army work, parades or drills. Barker and I appeared to live in a world apart from the masses there. As far as I was concerned, that could go on forever. Next week: Sam gets a new partner on his trips into Le Havre… which leads to problems involving Cockney rhyming slang (“Wormwood Scrubs” anyone? ), the local licensed prostitute and Marie-Louise heading off a minor international incident. ** Just noting here an incident my father had no knowledge of, but which connected with his first experience of sailing abroad. On October 28, 1916, a mine wrecked the British hospital ship Galeka off Le Havre (no patients abroad, 19 RAMC personnel killed). When, earlier the war, she had served as a troopship, she conveyed my father’s 2/1st Royal Fusiliers from Southampton to Malta via an infernal storm in the Bay Of Biscay – see Sam’s Blog dated February 8, 2015.